This is a story with pictures, it is a fairly fast read. BUT this is an important story. It could be a real eye opener for you as we explore the idea that Islam is the last days kingdom. The kingdom that completely takes over all religions, demands complete loyalty and total obedience as well as worship of its God, while it completely rules all aspects of society and government as well! This is an accurate description of the kingdom of the Antichrist. A word about last weeks lesson on Daniel 9:26, I hope you have begun looking at the verse, outside of the Roman framework. It is a fact that Jerusalem will be greatly hit by the army of the prince to come during the Tribulation period. Zechariah 12:2 Behold, I will make Jerusalem a cup of reeling (time marker for end times) unto all the peoples round about, and upon Judah also shall it be in the siege against Jerusalem. Zechariah 14:2 For I will gather all nations against Jerusalem to battle; and the city shall be taken, and the houses rifled, and the women ravished; and half of the city shall go forth into captivity, and the residue of the people shall not be cut off from the city (the others will be allowed to remain). I believe those allowed to remain will very possibly be the Arab population. Once again, Jerusalem will fall into Gentile hands, but just until Jesus returns. Now, let me share with you this history story in relation to Islam, and why we should be watching Islam instead of the Church of Rome or Europe/ EU. After the fall of Jerusalem in 70 ad, Jewish Christians, Gentile Christians and Orthodox Jews scattered throughout the Middle East, Asia Minor and Northern Africa. One of these communities was Constantinople. 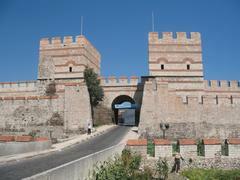 Constantinople was the capital of the Eastern Roman Empire. For a thousand years Constantinople was quite simply the city: fabulously wealthy, imperial, intimidating—and Christian. It offered trade, defense, and food—all of which brought many armies to its gate. It was "The Red Apple." Constantinople was built on seven hills like antique Rome by the emperor Constantine the Great. At the time of its splendor, the city had beautiful shining large churches and sumptuous palaces built at the top of its seven hills. It was quite stunning, as is the wall. Anchored in the center of the city was the great church of St. Sophia, built dedicated in 537. 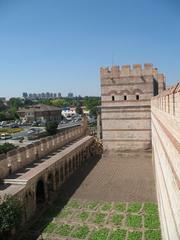 It was the most extraordinary building in late antiquity, a structure whose immensity was matched only by its splendor. The huge levitated dome was an incomprehensible miracle, wrote eyewitnesses. "It seems not to rest upon solid masonry but ... as though suspended from heaven. It encased a volume of space so vast that those seeing it for the first time were left literally speechless," said Procopius. "The vaulting, decorated with four acres of gold mosaic, was so brilliant that people could scarcely bear to look at it" according to Paul the Silentiary. Christianity flourished and spread throughout the area. Constantinople was located in the far northern end of Turkey. 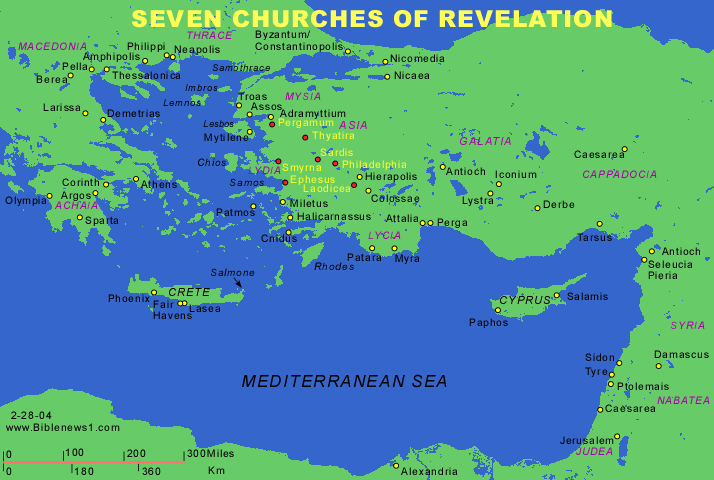 Dotted down through the south is where the 7 churches Jesus addressed in Revelations are located, see the map below. The red dots are the 7 churches of Revelations, the rest of the yellow dots are Bible towns that had churches that Paul, Timothy and others visited and or wrote Epistles to. This is a map of all the places you read about all through the New Testament. You had Christians all through this area. This is the original Bible land of the New Testament. Then, Constantinople was defeated by Sultan Mehmet II and his Ottoman Turk forces on May 29, 1453 ad, using new gunpowder siege artillery. The capture of the city communicated to Christendom and to the world the superiority of Islam over Christianity—just as it still does today when they convert a church into a mosque. The same applies when they convert a synagogue to a mosque. Islam's intention is the same as any nation raising their flag above the flag of the ones they have just conquered. Their mosque is their flag! That is the TRUE meaning behind having a mosque at ground zero! The great Cathedral Hagia Sophia, the Church of the Holy Wisdom, located in Constantinople and hailed as the largest church in the world for literally hundreds of years was desecrated and converted to a mosque on May 29, 1453, by the Ottoman forces. Everything of Jesus Christ and His saints was destroyed, removed from the holy sanctuary, never to be used in the service and worship of Christ again. In fact, every church in the city was stripped and converted into a mosque with minarets added. Hagia Sophia was to Christianity what the temple was to Judaism or Vatican City to Rome. After Constantinople was destroyed, it resembled Pompeii more than the City of Gold for which it was known. The whole city was deserted and emptied and appeared ravaged and charred as if by fire. Although the Sultan had promised his army three days of looting, it had effectively been picked clean in one. The soldiers then turned their attention to the fabric of the church. They hacked the icons to pieces, stripping away the valuable metal frames and seized "in an instant the precious and holy relics which were kept safe in the sanctuary, the vessels of gold and silver and other valuable materials." The great church reverted to a shell. When Constantinople fell to the Muslims, the entire country of Turkey and eastward all but ceased to exist as a land inhabited by Christians. None of the churches exist today, clear evidence that Christianity, was effectively "cut off" with the fall of Constantinople. Now Islam has all of the Middle East, Asia Minor, Arabia, most of Africa, many islands such as Indonesia, and Philippines. Europe and Great Britain are being heavily infiltrated. South America has a growing number of Muslims, Canada also, and the US is beginning to bow to their demands. They are infiltrating our government, both local and national. They have access to a listening ear in the White House. Is anyone in Christendom awake? Are American's awake? Look at the map again. Here it is, centuries later and nothing has changed, Islam still rules this area, and much more beyond. It certainly isn't Bible land anymore! Now, Islam is finishing up the business of wiping out the Christians and the Jews, should they find any within their borders! If they do not, they go to borders where the Jews and Christians do live in an attempt to assimilate them or wipe them out! Face it, Islam is a strong, ruthless, violent spiritual force; one that is winning most of planet Earth. I have a question for you - can you imagine these people, converting from Islam to another brutal religion, either by persuasion or force? Can you really imagine that you could threaten them with beheading (antichrist's method) since they are willing to die with you in order to kill you? What can you threaten them with that they won't do to themselves? Let's say for a moment that they are not the antichrist kingdom; what could the Antichrist do to them that would cause them to surrender? Do you see any religion emerging anywhere that could pose a real threat to Islam? Besides Constantinople, there were 3 other Christian Bishop seats of religious authority that are no more. They are: Antioch, Alexandria, and Jerusalem, leaving only Rome of the West unconquered. All were conquered by Islam, along with the subjugation of the people, and forced conversions. Churches and synagogue were all converted to mosques or destroyed. Only one has come back from Islam, God's holy city Jerusalem! And even now, the place where Jesus was born is no longer Christian, it is now completely Islamic. Antichrist ruling over the place where Christ was born. Israel is hanging on by a thread, and this administration is encouraging them to cut that thread by cutting their land mass, move Islam even closer so that Islam can conquer them more easily. Remember the book we discussed, "Temple at The Center of Time" which is based on Newton's work. It dealt with the distances in nautical miles between Temple Mount and locations with prophetic importance. Do you remember that the distance between The Kabba in Mecca Saudi Arabia and Temple Mount is 666 nautical miles! Coincidence? Maybe, but I really don't believe in coincidence anymore. Holiest site for Egypt’s indigenous Christians turned into war zone under Muslim B’hood leadership. Just what is all this jihad activity in the western world, and the US Boston Marathon? It is the same thing they did in Constantinople, Antioch, Alexandria, and Jerusalem, only using tactics that have proven successful in western society. The people will eventually appease them in order to get the killing to stop! This week, the US has moved into another type of Islamic jihad. I suspect this is only the beginning of a long and dirty fight.